Washed in happy hues, this HDB flat in Bishan is a true source of joy for a lovely family of four. With the generous amount of sunlight that streams through the windows and vibrant colours splashed on the walls, this 89-square-metre HDB flat is an intimate and happy enclave for Alf and Evelyn Tan-Rogers and their two adorable kids Layla and Z. Airy, open, bright, breezy, very casual yet cosy—a dream home indeed for this small family. To keep the interiors from looking too nondescript and clinical, Alf and Evelyn had decided their second family home would boast of character and personality. "My husband originally wanted a modern space of whites and greys. But I'm more of a colour person," shares Evelyn. "So our decorator encouraged us to introduce some colours into our home. We tried to delay adding hues but she probably thought it would either take us forever, or that we wouldn't do it at all." And what a world of difference these bright shades brought to their home! Although it took them a long time to decide on which colours to use, Alf and Evelyn knew that painting their walls in vivid colours could actually help define their home's interiors and create focal points. A parfait pink wall and red mailbox greet you by the entryway. Imagine the other surprises in store for you in this home! As thoughtful parents, Alf and Evelyn decided to use Layla's favourite colour for that added oomph in their living space. With the help of their decorator, the couple picked a cheery shade of yellow to go with their little girl's choice and their original plan of a white-and-grey combo. The result: a multi-hued striped wall that takes centre stage in the living room. Guests are greeted by a boost of vibrancy upon setting foot into this home, thanks to the parfait pink wall by the entryway. This space used to be the recess area (common corridors), which was bought by the previous owner. The family would decorate this space with holiday-themed ornaments during occasions such as Christmas. Openness is a big deal for Alf and Evelyn. They knocked down walls to create an open-plan layout for their Bishan home. One bedroom was converted into their work and study space. Furniture include daybed from Lorgans The Retro Store, coffee table from Xtra Park Mall, dining table customised by designer Seven Heaven Pte Ltd, dining chairs from Comfort Design, dining room lamp and living room lounge chair from Motto. Alf and Evelyn encourage their kids to read so they set up a reading corner in the study and work space. The old MRT signage—a nice addition to the bare wall—was from Evelyn's father, an engineer who worked for the MRT in the '80s. A bright boost courtesy of the yellow wall makes the study and work space more lively. This is also where Evelyn works on her blog, The Bottomsup Blog. The family has been living in this home for the last five years. "This is our second home. We used to live in Little India, which is very colourful but can be quite chaotic at times. We wanted something different so we started looking for a new place," says Evelyn. "When our agent brought us here, we instantly liked the surroundings and that was the first time we'd both liked a neighbourhood. We took it as a good sign, so we got this place and we didn't regret it. I think we just wanted a more peaceful and greener environment," she adds. Alf and Evelyn, who fell in love after meeting in a music class they both didn't belong to, wanted an open space that encourages lively conversations and bonding with family and friends. So they knocked down some walls, turned a bedroom into an open-concept work and study area, and furnished their small space with minimal furniture and decors. Layla's room features details that were lovingly made by people close to her: hand-painted knick knacks by her maternal grandma, teddy bear sewn by her paternal grandma, and a dollhouse created by her grandpa. 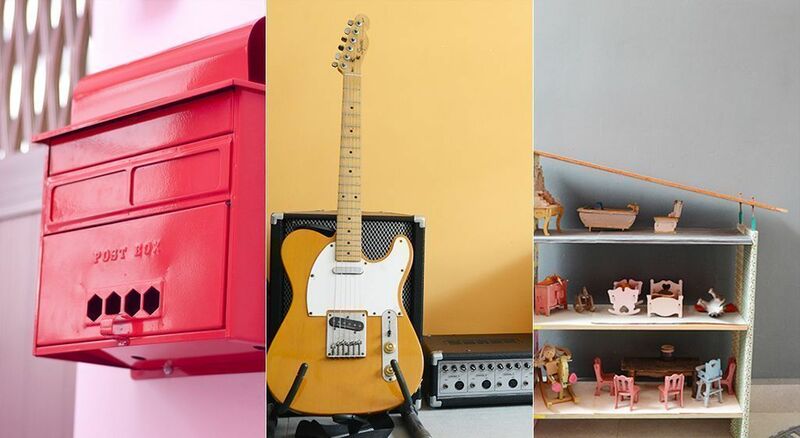 Layla's room houses a number of Instagram-worthy items, and most of them have heartwarming stories behind them. Her bed was a hand-me-down from a family friend. Although it has that vintage look and vibe, it's actually an IKEA bed—the parents harnessed its weathered and worn look to create a dreamy daybed for their little girl. They also recycled a Christmas light display shaped in Layla's name that was used for her birthday party to adorn the wall beside the bed. Evelyn's mum is into painting—a number of the knick knacks in Layla's room were hand-painted by her. Alf's mum, on the other hand, is passionate about sewing—she lovingly made the cuddlies and teddy bears on Layla's bed. Another labour of love is the dollhouse that Layla's grandfather built from Daiso wood planks. "I love this room because it reminds me of the people who love us every time I look at the handmade items in it," muses Evelyn. The bathroom in the master's bedroom has the Grohe's Rainshower Flower, winner of the Product Design category in the Red Dot Award 2014. The kitchen sports a cheery yellow hue. Opposite the countertop is the art gallery wall. It's Christmas all year-round in this home, because of the Christmas tree made up of notes, letters, and cards. Even the kitchen is sporting a sunshiny colour. "My husband wanted a raw look for the kitchen, but with a sense of warmth. So our designer recommended yellow for some cheer in this space. With a lot of greys and whites, it could look very stark," explains Evelyn. On the wall opposite the kitchen counter and cabinet lies a rich treasure of artworks—an art gallery for the family, by the family. Alf, Evelyn, Layla, Z, and Aunty Jac brought out their inner artists to fill up this art corner. And did you see that Christmas tree made up of cards, notes, and letters? It's certainly Christmas all year-round in this home! Total space: 89 sq. m.
"Openness is a big deal for us—we opted for open storage, a sense of space, and glass windows that provided a clear view of what's outside," beams Evelyn. "We try to keep things at a minimum. Every month, we sell or donate stuff. Once you start adding clutter to your home, it becomes very messy and it looks smaller." Master's bedroom: "Some of my items are from Cash Converters and the Salvation Army. Thrift shopping was something that my husband and I used to do quite a bit of in our 20s, but we seldom do that now as we're trying to live simply, with less stuff." Layla's bedroom now features second-hand bed from IKEA, roll-top desk from Junkie's Corner, and name display light from Lemony Design & Goods. Kitchen: Alf and Evelyn replaced the tiles in the kitchen and introduced cheerful colours to make the space more welcoming and vibrant. Study and work space: Because Evelyn works from home, she made her home office work for her by making it much more alive with colours and personal collections. For clutter-free home, do not buy or store unnecessary things. Try to keep things at a minimum so that you don't have to deal with clutter issues in the house. Evelyn suggests donating stuff—which they do every month—or recycle or repurpose them. Things do not have to be perfect all the time. "There might be times when kids would draw on them or something might happen to these items. We look at those not as defects but as character." You can survive in a modern home that is devoid of amenities like TV and air con. Yes, they did away with air conditioning because Alf is allergic to a lot of things. "He actually stopped sneezing when we moved here. Also, more air is coming in because of our windows and the open plan layout," says Evelyn. As for doing away with the TV, she says that it's helped them to have better conversations with their friends and family when they visit. Although it can be a daunting task, introducing colours to your home can instantly change its look and tie up all the elements in it. Read on for some tips on how to pick paint colours that should go up on your walls, how to select a colour palette, and what colour schemes to use for your home.